In crafting this recipe, I was reminded of the fact that the reason I love to cook is because it is one of the few tasks that allows me to both obsess over ingredients and elevate them at the same time. The creation of this recipe started with a memory – I was in Italy for the summer on a study abroad (aka. the photography boondoggle in Europe) with my good friend Lauren. There were easily a hundred of us living in Orvieto, all crammed into the same little hotel, each with our favorite spots in the town that we had claimed as our own. Lauren was in love with this one haunt for lunch, and not only did she try to eat there just about every day, but she informed me over a bottle (or two) of white wine that she tended to always order the same thing – the simply dressed green salad and tagliatelle with fresh porcini mushrooms. I loved the town already, but that lunch made me weep with joy at how lucky we were to be there. Fast forward to a year ago, I was on my yearly mission to raise funds for the National MS Society to participate in a 50K walk through DC. In trade for a donation to the cause, I decided to try my hand at selling custom recipes for friends. Lauren took me up on the offer and asked for a vegetarian recipe that celebrated ingredients she could find at the farmer’s market. At the time, I was obsessed with dinosaur kale (also called cavolo nero or black kale), a leafy dagger-shaped green that held up to all sorts of cooking techniques with aplomb. I decided to create a dish that would marry the simplicity of that rustic fresh tagliatelle and mushroom dish with a rich pesto made from the raw kale. The result was earthy, complex, soul-satisfying, and best of all, easily constructed with ingredients found year round. As I feasted, all I could think was that I was looking forward to the day that I’d be able to do more than share the recipe with Lauren, but cook it for her as well. In the meantime, though, I’ll have to have the shrooms and dinosaur on my own. Begin by reconstituting the mushrooms – put them and the smashed garlic clove in a bowl and pour enough boiling water over the mix to cover. Let sit for a few hours so that the mushrooms can plump up in the hot tub. Now, for your pesto – add the kale, parmesan, pinenuts and garlic in the food processor and blitz. With the processor on high, stream in the olive oil. Scrape out the pesto into a bowl and stir in the white wine vinegar, and add the salt and pepper to taste. Cover the bowl with plastic and refrigerate. Drain your mushrooms and toss in a bowl. Add the ricotta, eggs, parmesan, parsley, basil, nutmeg, pepper and salt. Pop in the fridge while you make your bechamel. Melt the butter and whisk in the flour. Cook your roux for about 30 seconds and begin to whisk in the milk in dribs and drabs. Add the bay leaf and continue to whisk until the sauce thickens. Whisk in the parmesan, white pepper, nutmeg and salt, and allow to bubble away over low heat. In lieu of fresh pasta sheets, we are going to get tricky and boil (!) some no boil lasagna sheets. Craziness, but it gets you a weekend-tasting meal on a week night. If you feel like making fresh pasta sheets, though, definitely have at it. To get started, butter a large casserole dish and pour about a cup of bechamel over the bottom of the dish to cover. Preheat the oven on to 400°. Put a shallow pan on the stove that is big enough to hold 1 or 2 pasta sheets at a time and fill with water – I use a frying pan with high sides. Salt the water when it comes to a boil and begin adding the sheets, allowing them to cook until they are pliant and rollable – about 4 minutes each. Using tongs, remove the pasta sheet to a cutting board or plate. Add about a 1/4 c. of the ricotta filling to the middle of the sheet, roll up lengthwise and place in the casserole dish seam-side down. 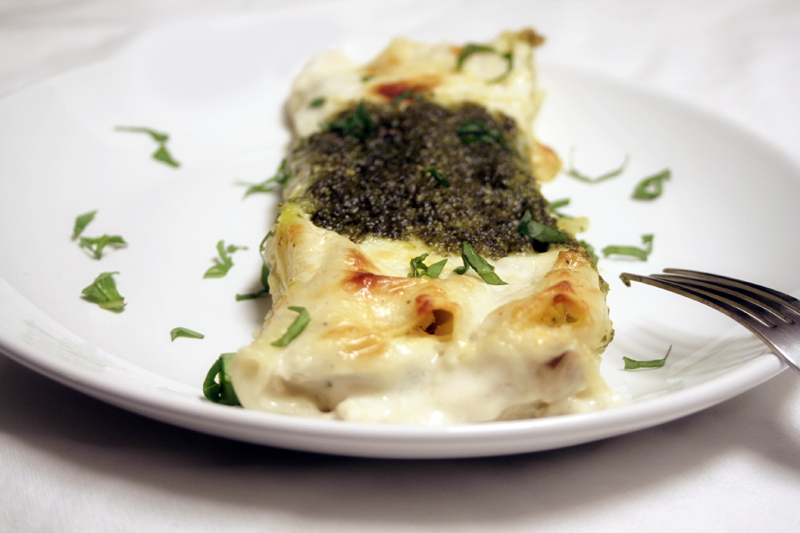 Continue to cook the sheets, fill them, and line up the cannelloni in the dish. 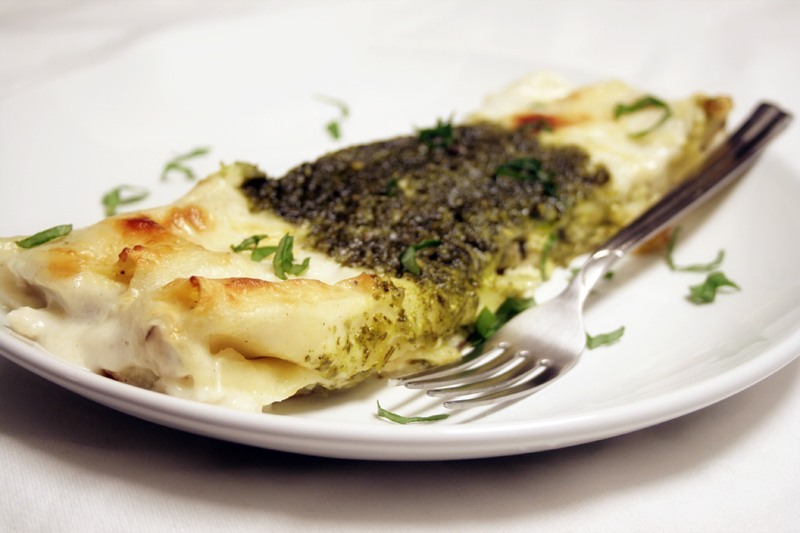 When you are finished, cover with the remaining bechamel and dollop the kale pesto on the center of each roll. Pop the dish in the oven and bake until bubbly and browned on top, about 25-30 minutes.